One of the most important aspects of heritage education is experiencing our culture. A historical monument is a rich source of History. It gives a sense of wonder and makes us curious to know more about the past connected with it. 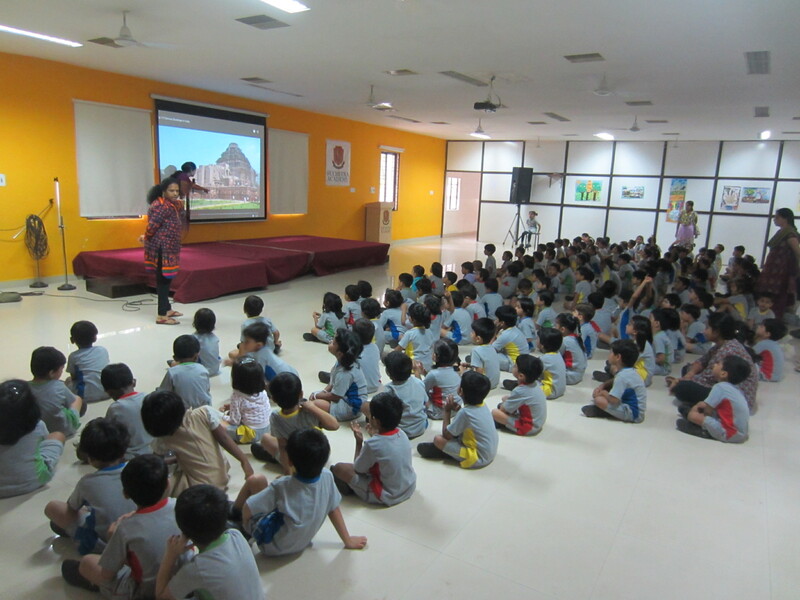 Pre-primary kids were taken on this journey through Power Point Presentation (PPT) on Tuesday 11th August. This PPT gave kids an opportunity to see the famous Monuments of India and understand the importance of preserving it. To understand the theme ‘Discovery of India’ better, children were taken on a Field trip to MCEME on Wednesday 12th August. 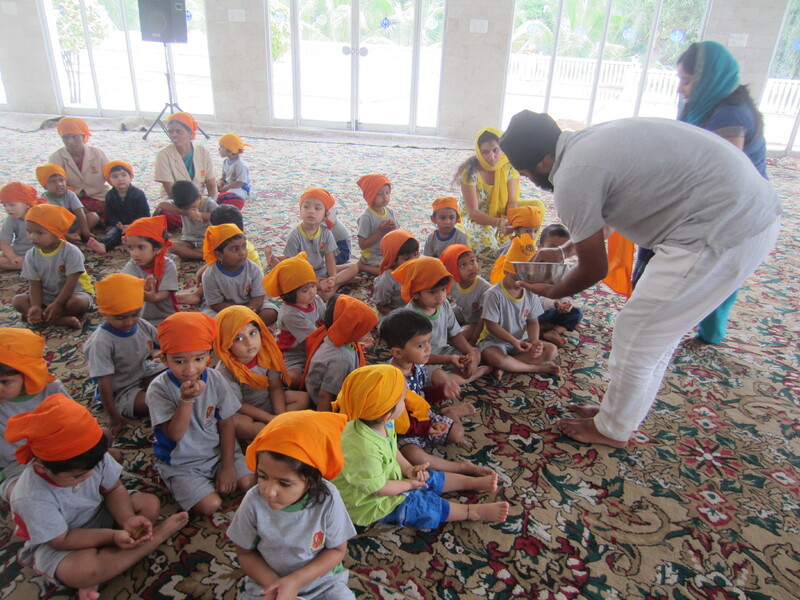 Children visited the Temple and Gurudwara to learn about the worship places of different religions. On Friday 14th August teachers presented a PPT on our Famous leaders and Freedom fighters. Through this PPT children were introduced to a galaxy of our great national leaders. This PPT helped children to identify the leaders and freedom fighters. Teachers in turn emphasized on the contribution of these great leaders to our struggle for an independent India. Various schools from Hyderabad participated in the Inter-School Recitation Competition held by Suchitra Academy on Wednesday 5th August. 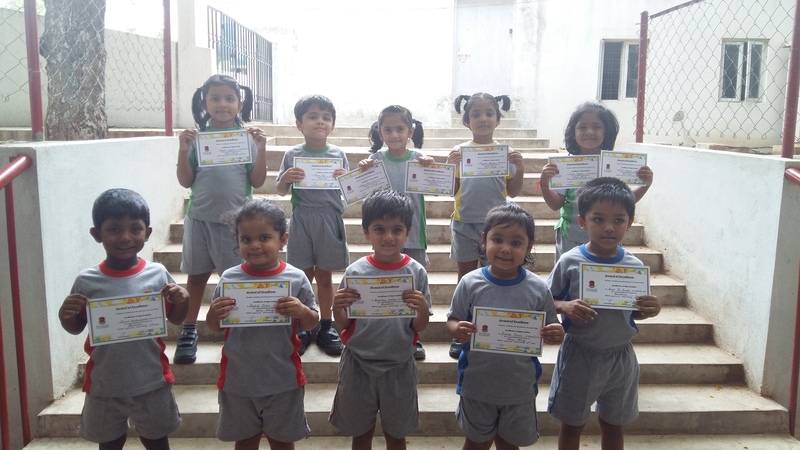 Children from Sr.KG. to grade 10 participated in this competition. Poems by known and lesser known poets captivated the audience. Our Sr. KG student Rebecca Robin participated and won the 1st place in this competition. 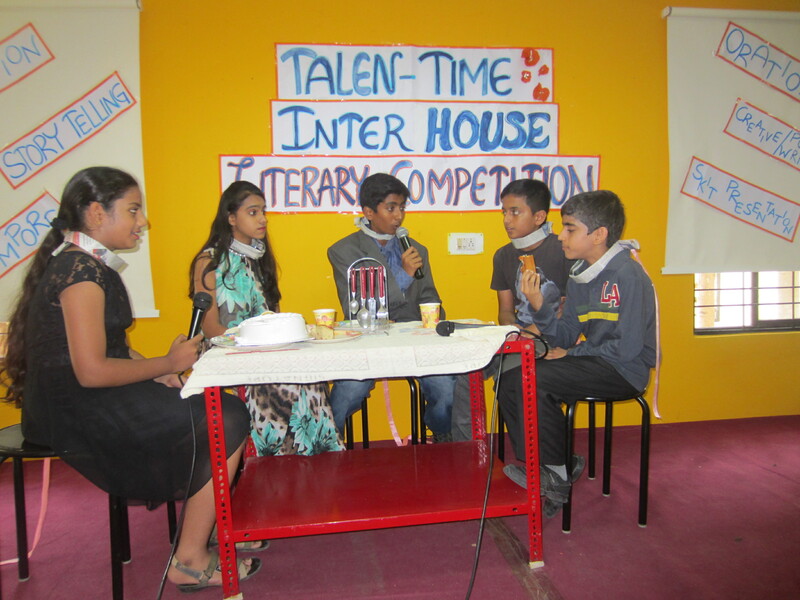 On Wednesday, 5th August an Inter-School English literary competition TALEN-TIME was held at school. More than 14 schools like Niraj International School, DPS Secunderabad, Bolton School, Pallavi Model School etc. participated in the event. On Friday, 7th August, students of grade VII went on a FIELD TRIP TO THE METEOROLOGICAL DEPARTMENT, Begumpet . They were briefed about the various methods of weather forecasting and were lucky enough to have a look at various instruments used for weather forecasting i.e. maximum -minimum thermometer, anemometer, wind vane, dry and wet bulb thermometer, rain gauge etc. They also visited the Doppler weather radar section of the meteorological department wherein they were briefed about the working of Doppler weather radar. The students were very inquisitive and asked many questions which were cleared by Mr.Venkata Narayana, Assistant Meteorologist who also acted as their guide. It was a very informative trip and a great learning experience for the students. On Wednesday, 12 August , Grade VIB conducted a special assembly o the topic ‘India’s Half Naked Fakir.’ With the Independence Day just round the corner, the assembly was a befitting tribute to Mahatma Gandhi, the father of the nation. The assembly started with a ppt which focused not only on the life of the Mahatma but also his works. It highlighted how other great leaders of the world were influenced by his philosophy of Ahimsa and stressed on the need to follow the path of ahimsa and brotherhood to solve all the problems in today’s world. As a special activity on Thursday, 13th August, an Inter-House Patriotic Song Competition was held. All the four houses sang patriotic songs with great enthusiasm and fervor. The winners of the competition were Sanskriti and Prakriti House. 15th August – Independence Day celebration ( 8.30 to 10.00a.m) Attendance compulsory. Parents please do get back to us if you have any suggestions or advise to give. It’s a pity that there is never a response to our newsletters –good or bad. It’s almost as if I am sending these in a vacuum with no readers or responders ! It would be great if these could turn into a two way communication in some small way. CONGRATULATIONS TO US ALL ON OUR 69TH INDEPENDENCE DAY. 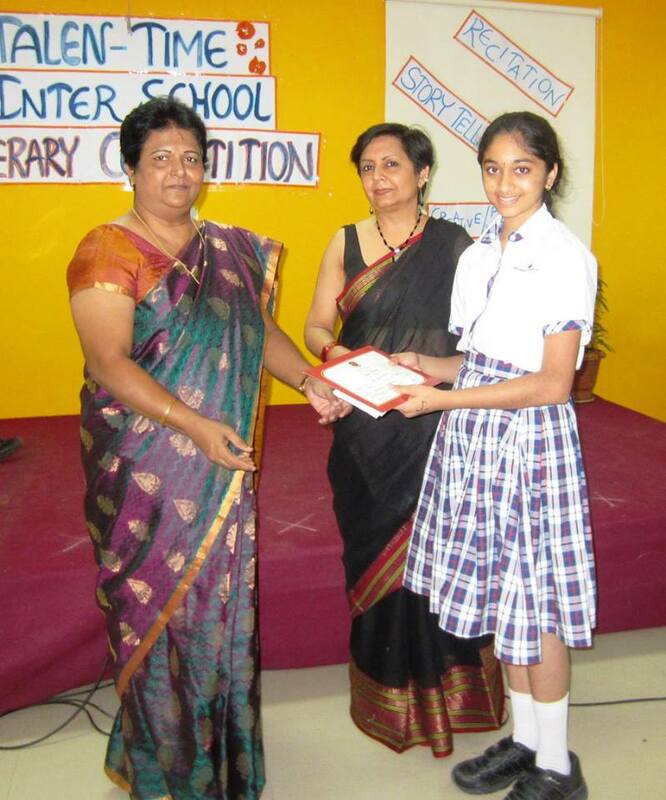 It was yet again another impressive event, to add a feather into the hat of our prestigious school, when we hosted the Inter school English literary competition for the 2nd consecutive year under the able guidance of our Director Principal Mrs Renu Shorey and Vice Principal Mrs Deepa Kapoor. It only proves the fact that, literature is the art of discovering something extraordinary about ordinary people and saying with ordinary words something extraordinary. 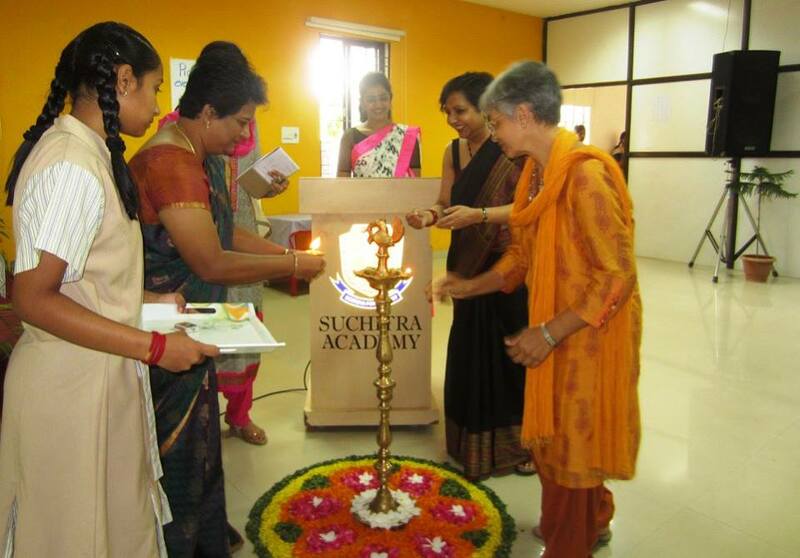 The event started off with the propitious lamp lighting ceremony by the guest judges Mrs Urmila Mahajan and Mrs Alice Mathew who are masters in their own fields, followed by a melodious school song sung by the school choir group. Some insight into the judges expertise : Mrs Alice Mathew a post graduate from Kolkatta University and who has been teaching in CBSE and ICSE schools, is always interested in literary activities and also trained children in a variety of literary activities. She has also written and directed many plays in Muscat. She is presently working as a language consultant. 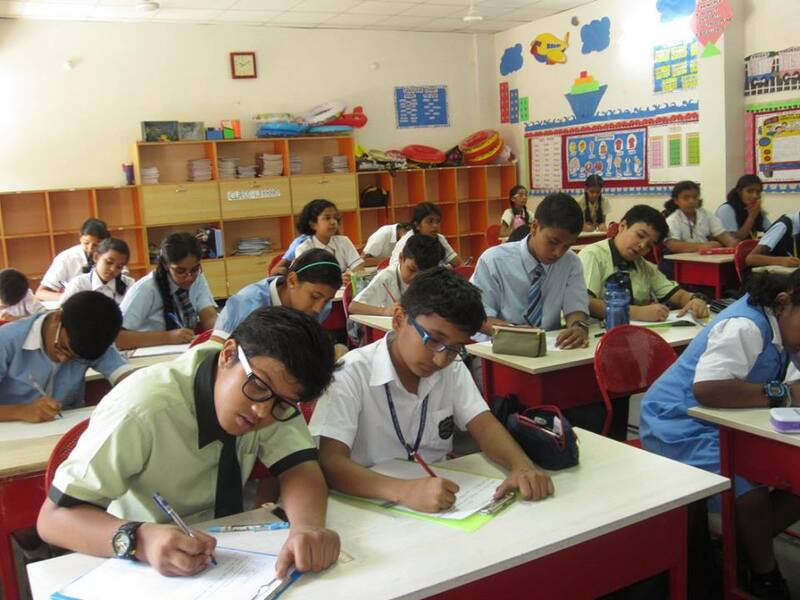 Mrs Urmila Mahajan, the English department head in a leading international school has wide and varied experience in the field of education for over 20 years. Her passion for teaching and learning English has led her to writing. After winning numerous prizes for writing poetry, she published her book of poems, Drops of Dew, in 2005. She was a columnist for the children’s magazine News and Stuff and is also the author of a children’s novel, My Brother Tootoo, published in 2013. 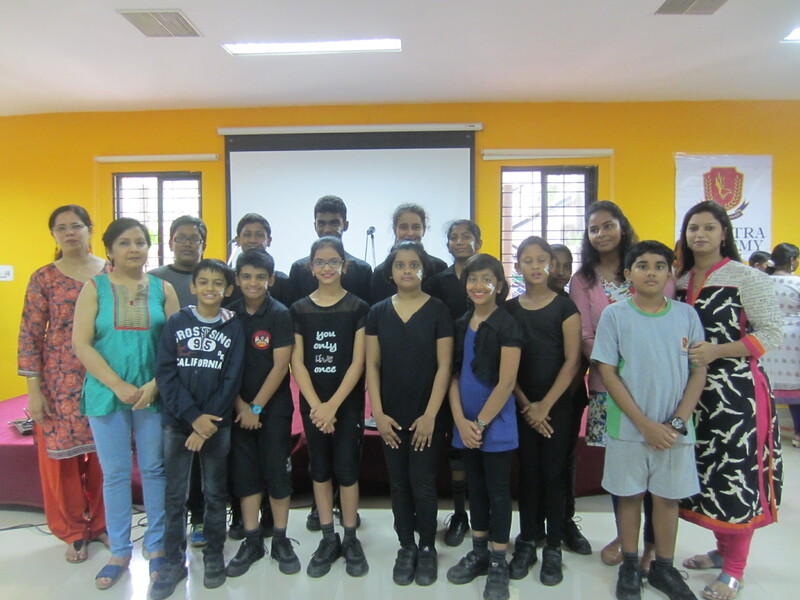 This event had an array of competitions: Solo recitation competition, creative writing and poetry writing competition, oration competition, story telling and extempore. More 12 schools including us as the hosting school participated in this event. The turn-out of the participants from various schools for this event had crossed 125. The list of participating schools are : Ganges Valley, Pallavi Model, Neeraj International, Nasr Primary, Jain Public, Kennedy Public, Bolton, Army Public School, DPS Secunderabad, Sadhu Vasvani, Meredian School and Suchitra Academy. Poetry is when an emotion has found its thought and the thought has found words. This event brought out the best recital talents in the children and the budding Shakespeare, William Wordsworth or Vikram Seth in the making. This competition was for students from Sr.Kg to Grade X. Speak in such a way that others love to listen to you, listen in such a way that others love to speak to you. That’s the key to achieve the best oratory skills. The oration competition brought out the best speaking skills and excellent stage presence and confidence in the children. This competition was for students from Grade I to X. Story telling is the most powerful way to put ideas into the world today. Story telling is an art which can transport you from one world to another world. This competition was for students of Grade I and II. The young chroniclers actually had us sail into a different world with their spin of imagination and tales. Speech is the mirror of the soul, as a man speaks, so he is. 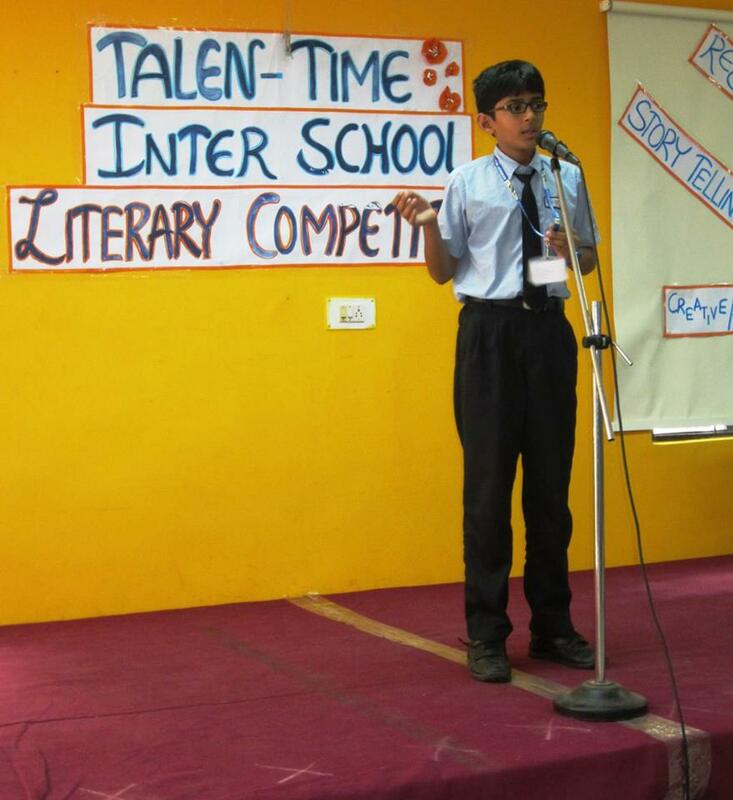 The extempore competition was for students of grades III to X. This competition brought out the spokesperson in each child, while their impromptu thinking and vocabulary skills at the spur of the moment were displayed. The ultimate victory in a competition is derived from the inner satisfaction of knowing that you have done your best and that you have gotten the most out of what you had to give. All the participants went back home, taking some valuable learning experience along. In her inspirational address, the judge, Mrs Urmila Mahajan gave some valuable tips about staging and language skills. She also highly appreciated the mentors, for the immense training that had gone in to bring the children to this level. She even quoted that the children are like clay, molded by the teachers. After the vote of thanks was proposed by the academic Co-ordinator Mrs Trisha C, and the choir group sung the school song, the event concluded with a note of not being sad that it’s over, smile because we were here and this has happened. The Suchitrans promised to come back again with the same kind of event the next year too. This month the Preschool class has been learning all about animals! Throughout the month, the children explored the following animal topics: animal homes, animal movements, animal young ones and animal cries. The “Habitat on land and water” theme was definitely a favourite among the kids. Children also enjoyed math/science activity where they sorted animals according to their habitat. This activity was a great opportunity to reinforce the children’s sorting and vocabulary skills. On Wednesday 22nd July the ‘Theme-Party’ added to the fun and frolic of learning. Children came with their favourite animal masks and pretended to be one of those animals. Teachers added cavort by playing animal games and also danced to the animal song with the kids. Recitation and story-telling is a performance art. Kids need to practice their performance skills. You can tell how well kids comprehend the poem/story by the way they phrase and deliver it. Getting the whole audience attention and (applause after the recitation) serves as a psychological reward for each child. It is never too early to encourage kids to stand up in front of people and perform and our kids proved it on Thursday 23rd July in the Final round. The children have been very interested and engaged in the topic of endangered species. FIRST WE TOOK TIME TO EXPLAIN WHAT THE TERM ‘ENDANGERED’ MEANT. Then we have been discussing how to protect these animals using various resources, understanding where these animals live and why they could be endangered and what can be done to preserve them. The power point presentation on Wednesday 29th July, on endangered animals enlightened the kids to further understand all the aspects on these endangered species. The entire week, starting 20th July, was a very busy week with a plethora of competitions celebrating the English Language Week. 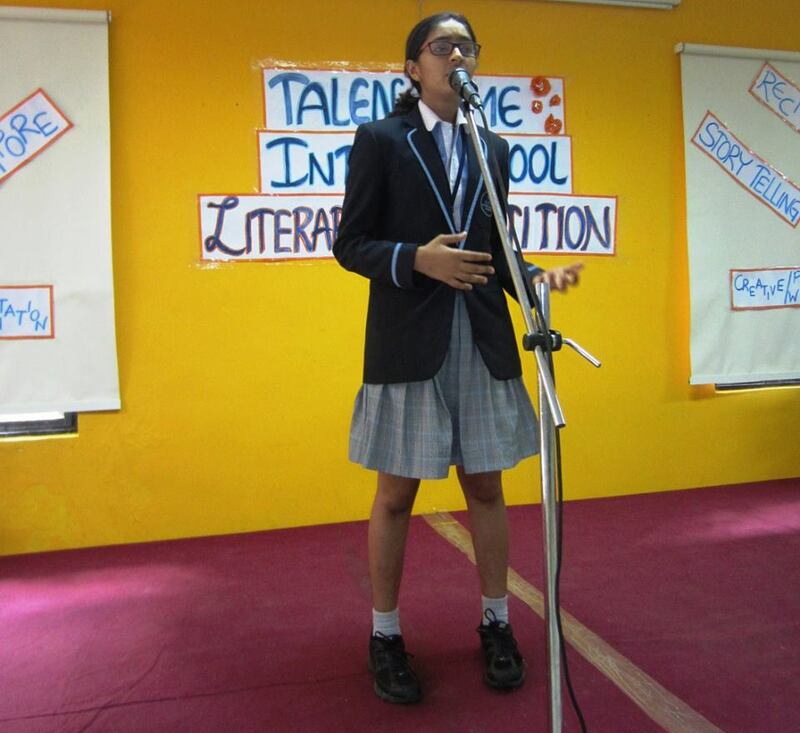 Monday, 20th July was the day of ENGLISH SOLO AND GROUP POETRY RECITATION COMPETITION. It was a day when Wordsworth, Shelly and Sarojini Naidu came alive on stage. The students recited poems beautifully and in perfect rhyme and rhythm. Some of the memorable poems were ‘When Things Go Wrong’, ‘Chatterford Market’ , ‘Never ask Your Mom’ to name a few. We were proud spectators as the children excelled. 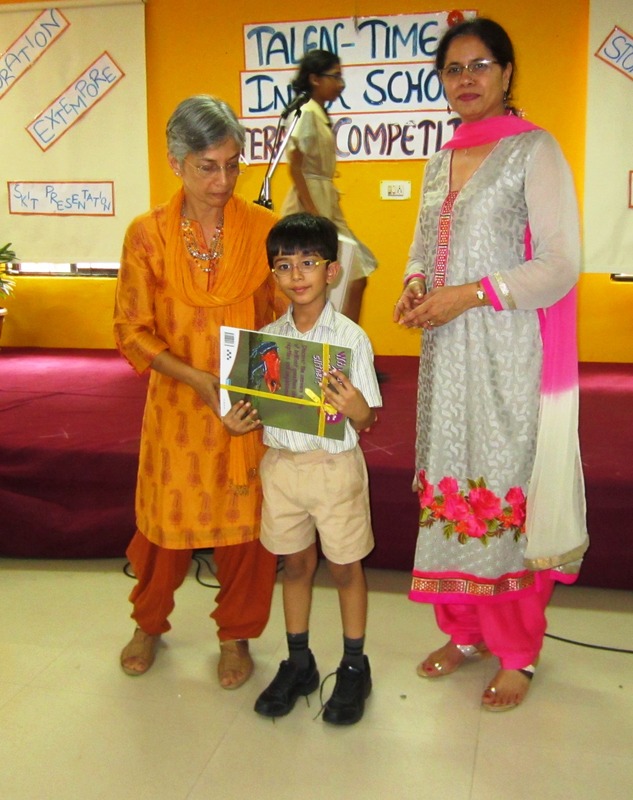 Mrs Madhavi Kapadia the head mistress of Nasr pre primary school was the chief guest and judge for the day. 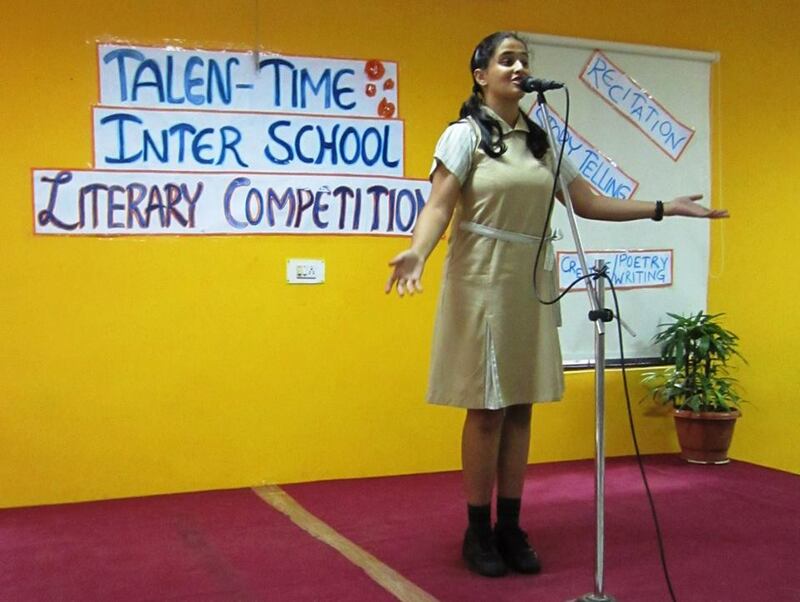 Tuesday, 21st July was the day of STORY-TELLING AND EXTEMPORE’ COMPETITION. Students from Grades I and II narrated some interesting stories and brought the characters alive with their voice modulations and beautiful props to support. The students of grades III to X taxed their imagination and exhibited their sense of humor while speaking Extempore’ on the topics given on the spot. Some topics which regaled one and all were ‘A day in my life as a pencil’, ‘Meal times in our house’ , ‘A day alone at home’ to name just a few. Mrs Sunila Mathur, head of department of English, Villa Marie degree college for women, Somajiguda graced the occasion and judged the event. Wednesday, 22nd July was a day for CREATIVE WRITING AND POETRY WRITING for all grades. Students had to write poems on interesting topics like ‘Being Invisible Is Fun’, ‘Life Is A Rainbow’, My Magic wand’ while some topics for creative writing were ‘An imaginary city’, ‘A place I would like to visit’, ‘Every time my dog barks, something unusual happens’ to name a few. Thursday, 23rd July was ORATION for all grades. The students had been given a topic a few days in advance and they gave a prepared speech. All the students were well prepared and even the little ones exuded a lot of confidence and poise. Some of the topics were ‘Discipline’, Pleasures of reading’, ‘What peace means to me’ to name a few. 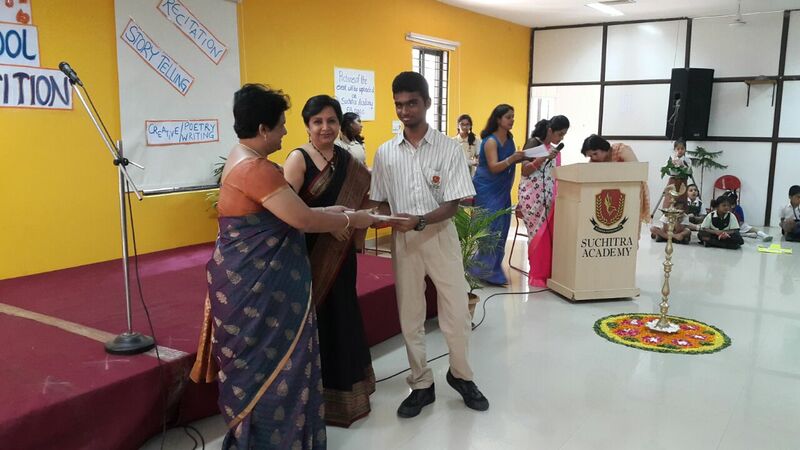 Mrs Anne Issac, Resource coordinator-Biology in DPS was the chief guest and judge for the day. Friday, 24th July was a day of dramatic extravaganza! 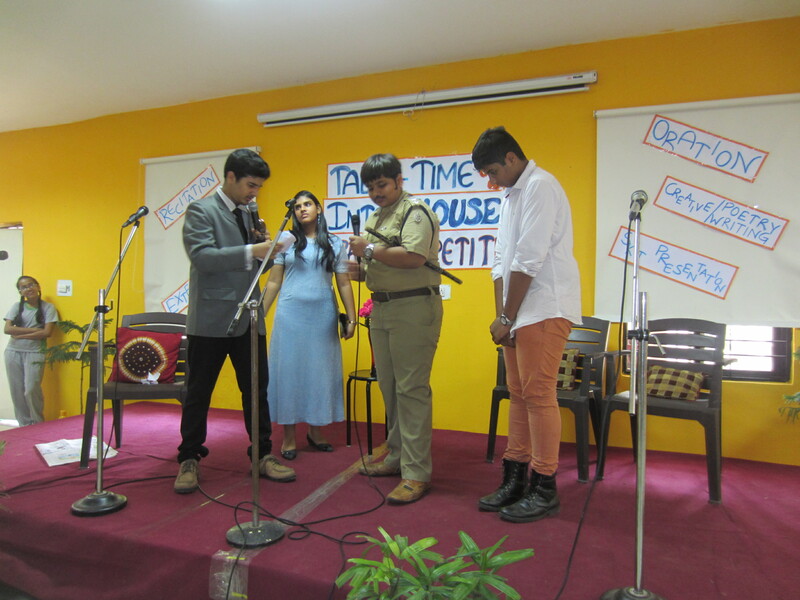 It was the closing day of the Language Week with INTER-HOUSE ONE ACT PLAY COMPETITION. It was the most awaited day of all as the hush-hush practices of the previous two weeks had ignited everyone’s curiosity and each and every child and student was eager to see how the pieces would fit together on stage on the final day. Both the junior as well the senior groups put up an excellent show and their dialogues and costumes brought their characters to life. The audiences just loved the plays and were rolling with laughter as they could easily identify with some of the situations and events. It was a befitting end to the language week. Mrs Satyaswami, pre-primary coordinator of our school was the chief guest and judge for the day. After the enjoyment of the English language week it was time to get back to studies. FA 2 began from Tuesday, 28th July and would be continuing till mid August. We are sure that the students would put their best foot forward and do well in these FAs. 10th August (Monday) – Bonalu Holiday. Please do not send the child to school unless he/she can be here for the full day. We do not allow children to do half or part of the day. This stands good even if the child has FA or SA or Spell Bee tests. Please follow this strictly. Please do not send child to school if he/she has cough and cold. The other kids are exposed and likely to fall sick. We will be forced to call you to take the child back home. 31st July is the last date of 2nd Term fee payment without any late fee charge. You are most welcome to come to school any day and have lunch with us. This will give you an idea of taste and quality. Please inform us before hand. We have been receiving requests from parents to organize Key- board and guitar classes in school, after school hours or on weekends. Please do send a mail to info@suchitra.in in case you wish to have us start these classes. Mention the name of your child/ class/ activity that you may want. It is our constant endeavor to upgrade all our programmes- academic or non academic and provide a more individualized attention to all our children. Your fee-back on issues would help us in this. Please do write back and let us know of any concerns or compliments.